As the CEO or owner of a business – your employees, clients, partners, shareholders, or board of directors look to you for vision, leadership, direction, and strategic guidance. But where can you turn for unbiased feedback, new ideas, fresh perspectives, experience-based knowledge, or peer-level networking? The CEO Roundtable. Recognizing a burgeoning need for top-level executives to meet, network with peers, and discuss their business challenges, successes, and opportunities, The CEO Roundtable was formed. The group was founded in May 2001 by David Lewis, President and founder of OperationsInc, and John Engel, Agent at Halstead Property, former CEO of Paper.com, founder and former President of e-Media. For the past 15 years, the Roundtable program has proven to be an invaluable resource for CEOs and top-level decision-makers dealing with business and operational issues and opportunities. 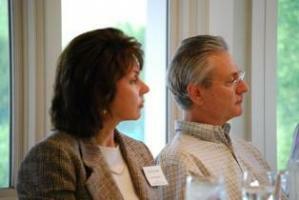 Specifically, it has benefited over 100 CEOs and leaders representing companies of diverse size and industry. 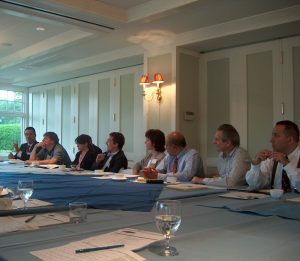 The CEO Roundtable meets 10 times annually. Monthly meetings are dynamic, free-flowing sessions, approximately two hours in length, and are expertly facilitated to foster interaction and active participation from the 25-30 attendees. The CEO Roundtable offers CEOs, owners, or others in charge of running a business an excellent opportunity to learn from other CEOs’ experiences and explore new thought leadership areas. This provides for well-informed decision making, which in turn enables improved business performance.